Regardless of the industry, line of business or trade you serve, executive recruiting should be more than just matching a checklist of skills and experience. 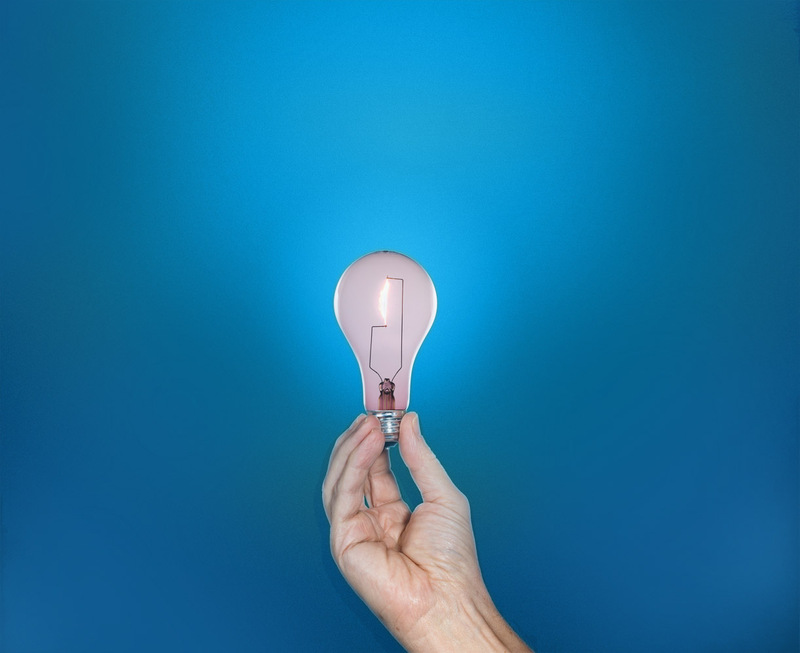 That’s why we’ve developed The SMART Search Process™, a unique executive search program that enables us to quickly and confidently find, select and present the talent that will best align with your hiring, financial and business goals. This custom-fit executive recruiting program starts with a synergistic effort to understand our client’s business situation, and involves a careful examination of prospective candidates, utilizing a myriad of tried and true executive search tactics. The result? Consistent delivery of the most qualified and capable in-market talent and a successful, longstanding, mutually beneficial relationship for all parties involved. The first step we take is to define particulars—not just for a role, but your company, mission and business goals. We work with you to establish the objectives and specifications of the position, and to understand the character and culture of your organization. What’s more, we’ll assist in pinpointing immediate and long-term expectations, and construct language that aptly reflects the advantages to working with your company. This way we have a thorough understanding of what you do and don’t want, and can best present your opportunity to candidates in the next step. We use a unique combination of research and recruiting tactics to find, attract and bring in professionals who not only meet the skills, experience and vision you require, but are ready and able to make their next career move. Industry and competitor analysis, an extensive referral network and hyper-targeted social media engagement are just some of the tools we use to acquire the right fit for your organization. Every candidate we choose for this step undergoes a comprehensive interview and career evaluation. We thoroughly examine work history, and a myriad of professional criteria, from awards and accolades to passions and ambitions. Even better, we become your champion, highlighting the opportunities and benefits associated with your company, all to ensure that the caliber and career objectives of the professionals we present will meet, if not exceed your expectations. Once the assess step is complete, we present a detailed summary of the most qualified, well-suited candidates in the market, and provide intelligent, realistic direction moving forward. We know these final steps can be difficult for both candidates and clients, so we make everything as easy and clear as possible, offering both parties practical negotiation guidance, coaching candidates through their transition, and maintaining active, open communication throughout the entire hiring process. We look at our clients as long-term business partners, and our relationships continue well after an accepted offer. We assist in resignation and on-boarding processes, and provide consistent, hands-on follow up well after the start date to ensure a smooth transition for you and your newly hired talent. Simply put, our goal is to help your organization achieve enduring prosperity with successful placements of qualified, experienced industry leaders. 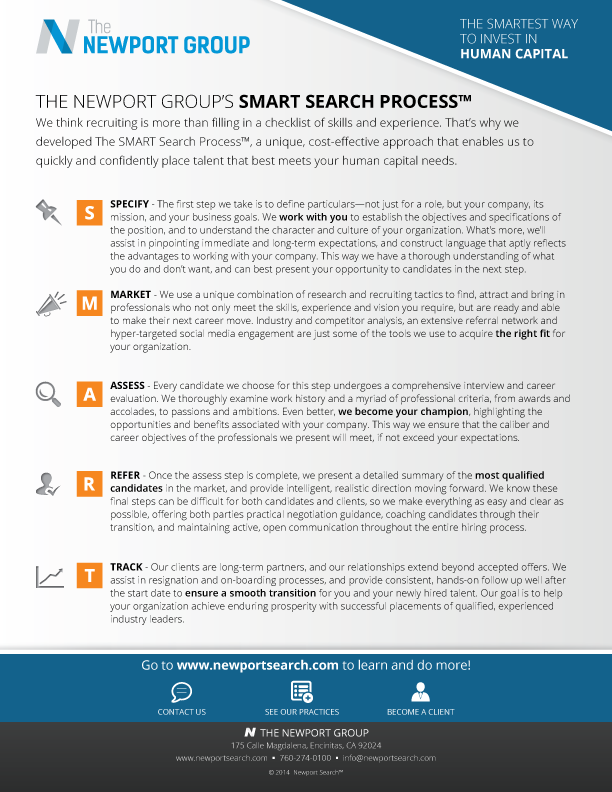 Download our SMART Search Process™ Overview and read more about how The Newport Group goes above and beyond other search firms with the most comprehensive and cost-effective executive search program in the business. Click the button below or the image to download it now. Contact us now to have our Executive Recruiting Professionals connect you with the right fit for your enterprise.